The Subway mirror is made of indestructible polycarbonate and is therefore particularly suitable for vandalism endangered areas for outdoor use. The mirror is fixed with silicone in a sturdy frame and is reinforced on the back. The supplied 4-point ball joint mount allows exact and optimal attachment. The mirror can be fixed either to the wall or to tubular posts (Ø 50 - 85 mm). The mirror is wind load tested up to wind force 12 (hurricane> 117 km / h). 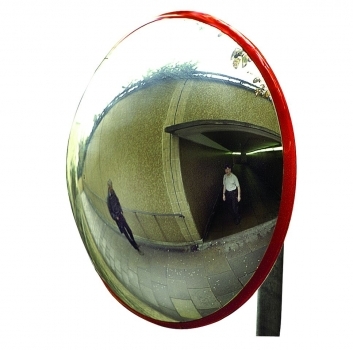 The Subway mirror is ideal for clearing up confusing areas, especially at underpasses, in subway stations or in multi-storey car parks. Especially for pedestrians, the Subway mirror offers more safety, as it has a 180 ° wide angle: unwanted encounters and surprises can be avoided. So the mirror offers a high degree of security.